AJ is a high-energy, focused performance trainer with an ability to equally reach the amateur player as well as the seasoned professional. He holds a degree in Exercise Science and Kinesiology from George Mason University. 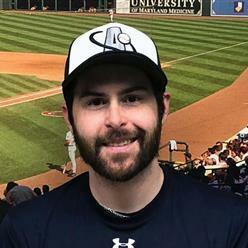 He is a Co-Founder of Advanced Baseball Training and Performance Center in Northern Virginia. In the last 6 years, he has performed over 10,000 training sessions at the center for both hitting and pitching. He has provided hundreds of additional hours at camps, clinics and seminars throughout the Washington Metropolitan Area helping players learn what it takes to achieve their goals. AJ's clients include: Professional Players of all levels, College, and High School. A.J. began his college career in Southern California at USC. After spending a year and a half with the college baseball powerhouse and legendary pitching coach Tom House, he transferred back to Northern Virginia with George Mason University. In three seasons at Mason he served as the closer in 2010 and as a weekend starter in 2011 and 2012. As a Patriot, he finished his career at Mason ranked among the career leaders in wins, saves, innings pitched, lowest opponent batting average, ERA, lowest walks per nine innings.